We met during my first visit to Austin. A friend introduced us, one who knew Clive well and visited the bar often. From the outside, it’s just another wooden house on Rainey Street with a big wraparound patio and dimly lit sign out front. But during my first night with Clive, I got to know what was on the inside. Needless to say, things escalated quickly. Clive Bar wraps you in the best kind of warmth. It is tasteful-hunting-cabin-meets-hipster, and I love it for that. It’s not douchey (sorry, Container Bar fans) and even with its leatherbound (yes, leatherbound) portfolio of drinks, it is so far from pretentious. Clive Bar is like that guy in a flannel shirt who buys the expensive bourbon and keeps it in a cabinet he made with his grandfather. It’s like the guy who takes that bourbon and makes you the best Mint Julep you’ve ever had and then surprises you with an Arrested Development reference to prove he’s not a tool. 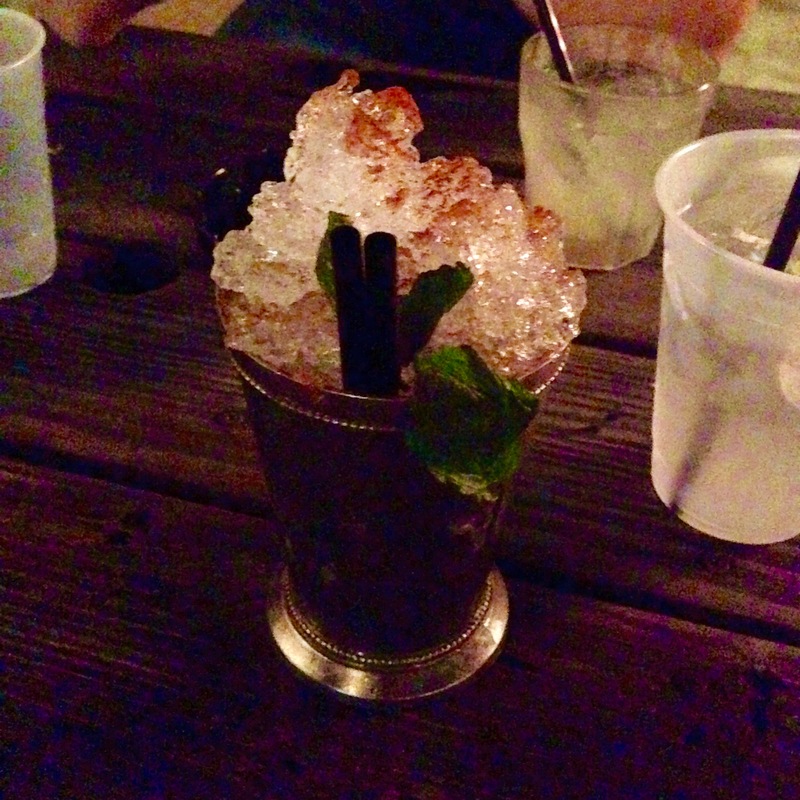 The Clive Bar Mint Julep is legit. I’m no Kentuckian, but Cincinnati’s proximity to the Bluegrass State has left me with a taste for bourbon and an appreciation for Derby drinks done right. My drinking companions were surprised at my patience as I watched the Clive bartender craft the masterpiece, but I was so entranced by the process that I could have waited forever. In a pewter cup just like the ones at the Derby, I watched my brilliant bartender muddle the mint, slosh in the Maker’s, add the simple syrup. He then piled the pewter cup high with crushed ice, creating a perfect snowcone-like shape. My bottom lip dropped. It looked so good. THEN, as if that isn’t enough, he sprinkled nutmeg on top and palmed a sprig of mint to top the frosty beverage. It was almost too pretty to drink. But drink it I did. I sat out on the patio with my friends on one of those perfect Austin Saturday nights (there are so many of those) and allowed the drink to go through its many phases: strong enough to put hair on your chest, then just the right balance of bourbon and sweet, and then that slushy, watered down phase that makes you want another. Clive Bar asks for your ID before they hand over a pewter cup (or a copper one for their stellar Moscow Mules) on the busy nights, but it’s worth it. As beautiful as the cups are, I wouldn’t want to steal from Clive anyway. Our relationship is too intense for that. If you’re not a bourbon fan, the spicy Moscow Mule is a fantastic play and the best $8 you’ll spend on a cocktail on Rainey. Seriously. My sister is coming to Austin in July, and one of the first things I’m going to do is introduce her to my flannel-wearing, bourbon-buying, cabinet-making paramour.